The work of the German-Italian artist Rosa Barba can be read against the background of an expanded notion of sculpture. In addition to issues of composition, the physicality and plasticity of form, time plays a central role. 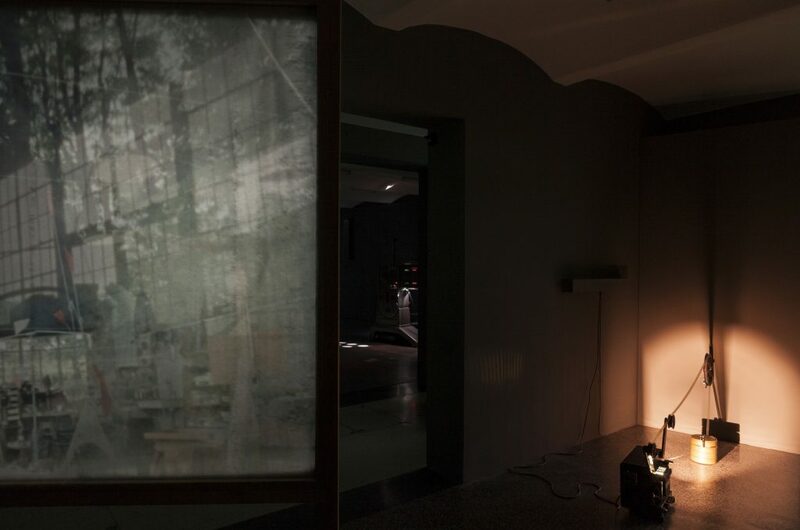 This aspect, combined with her interest in how film articulates space, sets work and viewer in a new relationship that is also mirrored in the content of her films. Each one is a topographical study of the ‘modern unconscious’. They are spaces of memory and uncertainty, which can be read as a reassuring myth despite the instability of the reality they depict. Barba’s filmic works alternate between experimental documentary film and fictional narratives and are not clearly fixed in time. They frequently focus on natural landscapes and human interventions in the environment and examine the relationship between historical records, personal anecdotes and filmic depictions. 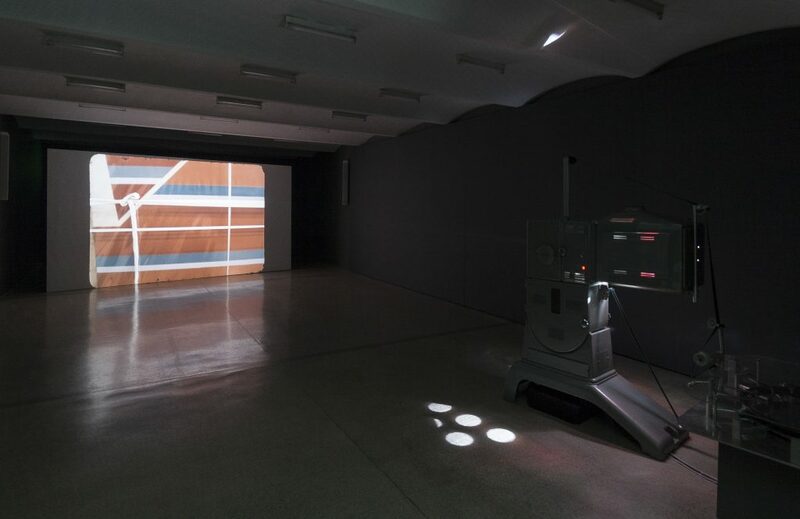 In her solo exhibition Spacelength Thought at the Secession, Rosa Barba presents a selection of films, which more or less deal with the notion of the archive, as well as some of her sculptural works. With Somnium (2011) and Disseminate and Hold (2016) that are shown in turns at the outset of the exhibition, the artist introduces two significant aspects of her work: on the one hand, the relation to literature as source for and reference in her works, on the other her interest in an open notion of the archive. Somnium directly refers to the novel of the same name, which the astronomer, mathematician and natural philosopher Johannes Kepler wrote in 1608 and which is considered to be the first work of science fiction. The text describes an imagined journey to the moon, and how Kepler believed Planet Earth would look like when viewed from the moon. In Barba’s film, shot in Maasvlakte, an expansion area of the Port of Rotterdam, Europe’s largest harbour, a disembodied voice reads passages from Kepler’s novel while a second, collective voice tells of how local residents and individuals who work here picture the future of this site. As in many of Barba’s works a marginal figure is the protagonist. In Somnium, only a single person is portrayed, a beekeeper, who despite progressing construction work still fosters his beehives here. To direct the attention to beekeeping and bees, of all things, and the essential role they play for the preservation of our ecosystem may indeed be considered a highly symbolic statement. 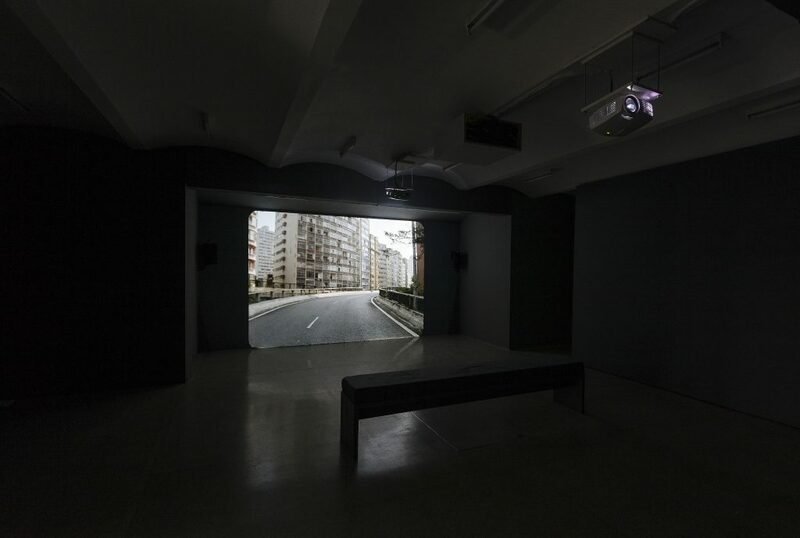 In Disseminate and Hold, on the other hand, the artist’s focus is on an elevated highway in São Paulo named Minhocão (‘giant worm’), which was completed in 1969 during Brazil’s military dictatorship. The film’s narrative unfolds the historical, contemporary and imaginary impact the structure has on the urban environment and with its own controversial reception in history, the development also acts as collective city memory. Not only does it serve to picture a chapter on urban development and social change in São Paulo but overlaying recorded text excerpts by the Brazilian conceptual artist Cildo Meireles, an outspoken opponent of the regime, underline the significance of the public in general, and for the arts, too. With these films, Barba offers two different approaches to her work, resembling the function principle of a relay. 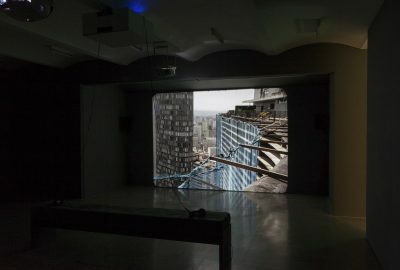 Like two entries, according to the situational context they allow for a mutable reception of the exhibition, for the films exude quite different atmospheres: against the backdrop of the Port of Rotterdam’s dystopian artificial landscape and underlined by Jan St. Werner’s soundscape that with its metallic, high-pitched tones and deep pad drones at times creates a disturbing mood, Somnium draws a bleak scenario, while in Disseminate and Hold a heavily frequented elevated highway that harshly cuts through São Paulo on a length of more than three kilometres is reclaimed as public space by the city’s residents. Here, even if fragile an upbeat mood is palpable and the percussion-driven soundtrack by the German-Brazilian formation Black Manual expresses intense energy. The 35mm film The Hidden Conference: About the Shelf and Mantel (2015), an investigation into the museum storage of the Tate in London that questions the status of art when it is not on display draws an imaginary conversation between the art works. For the first time in Europe, Barba is showing her only recently completed film Enigmatic Whisper (2017), a poetic portrait of one of Alexander Calder’s kinematic sculptures shot on the site of his studio in Roxbury, Connecticut. Free improvisation music by Jan St. Werner, John Colpitts and Andrew Barker emphasises the film’s poetic quality. 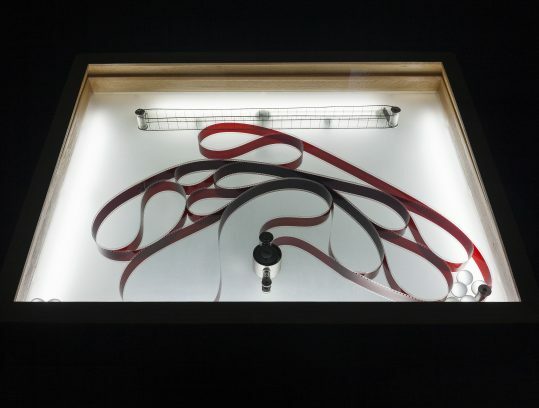 The kinetic sculptural works Stellar Populations (2017), which was developed especially for the exhibition, and Coupez ici (2012) each show a 35mm film strip meandering away inside a light box, driven by a motor. In the celluloid’s uncontrollable movements a both anarchic and playful element is manifest. The projected shadow in Boundaries of Consumption (2012) – the result of the interplay of an unexposed film strip that sets two metal balls lying on top a pile of film reels in motion and the light of the projector – is, in turn, in a constant state of flux and presents an at all times fleeting image; one that cannot be objectified. Here, Barba addresses the ambivalence of the notion of the consumable commodity, which is undergoing fundamental changes in the present digital era. As always in Barba’s film works, imagery and audio are treated equally, and the high level of her soundtracks is remarkable. 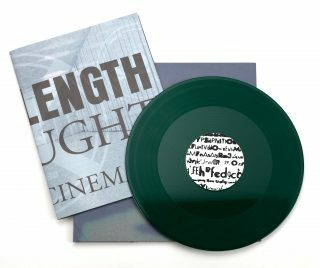 Taking this into account, the Secession and the artist are releasing a 12” record with the film score of her latest film, Enigmatic Whisper. On the occasion of the exhibition also issue #17 of Barba’s edition series Printed Cinema is released. 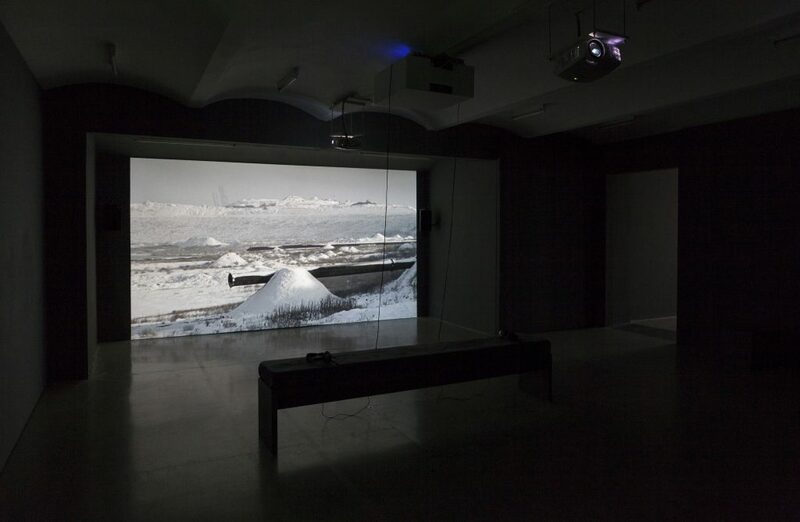 The artist has been publishing the series, which functions as a kind of secondary literature to her films since 2004. Each issue is available only on site of and during the respective exhibition. Rosa Barba lives and works in Berlin. Each label is a unique print by the artist.